Flagstaff Boathouse is in the grounds of Flagstaff House which was once the home of Captain Woodget of the Cutty Sark and is situated in a prime position at Burnham Overy Staithe. Following the tidal surge along the coast, The Boathouse has been completely refurbished to a very high standard with all new carpets and furniture. 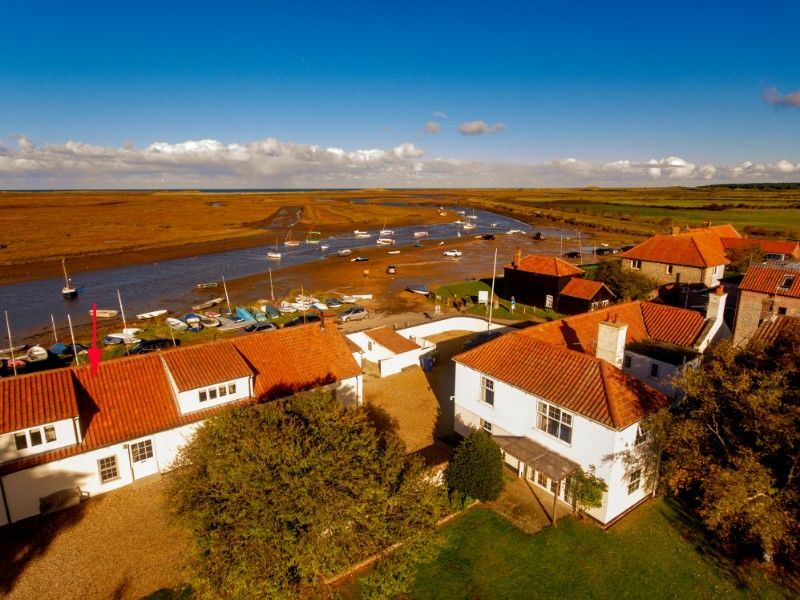 It has absolutely breath-taking views from the open plan sitting room, dining area and kitchen across the creek, the staithe and out to sea. It may be rented with the adjoining Flagstaff Cottage to provide accommodation for up to 12, or with Flagstaff East and West for up to 23 people. There are stone floors throughout. Bedroom 1: Twin beds, bedside table and lamp, wardrobe, chest of drawers. Wet Room: Power shower, WC and hand basin. Utility Room: Washing machine, tumble drier, airing cupboard. One large room with fantastic views across the staithe - really does need to be seen to be appreciated! Sitting Area: Comfortable sofas, TV, video and DVD. Dining Area: Table and 8 chairs. Kitchen: Well-equipped with built-in fridge/freezer, dishwasher, electric oven, microwave. Bedroom 2: Twin beds, bedside table and lamp, chest of drawers, wardrobe. Bedroom 3: Double beds, bedside table and lamp, chest of drawers, wardrobe, armchair. Bathroom: Bath, shower mixer taps, WC, hand basin. There is a cot, a highchair and stairgate available if required. Large garden, mainly lawned with garden furniture. The garden is shared with the 3 other Flagstaff properties. Dogs are now welcome subject to owners agreement for a fee of £35.00 per dog. The changeover day for this property is Saturday.